Nearly two months ago, the VMware View app was released by VMware for the iPad and I wrote about it here. Since then, many in the community have been curious as to what the end user computing experience was like. 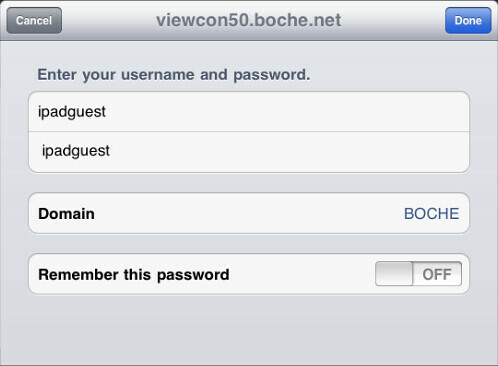 They have iPads and of course they have free access to the View app but they lacked a VMware View environment to connect to, particularly a remote over-the-internet scenario using View 4.6 5.0 5.0.1 GA and PCoIP. Step 1) Grab yourself an iPad if you don’t already have one (1st or 2nd generation both work). Step 2) Connect your iPad to the internet. Be sure TCP/UPD 4172 ports are not blocked. Step 5) If you’re prompted for credentials at Windows 7 logon, use the credentials shown above. Step 6) Enjoy but do try to limit the duration of your connectivity. The Windows 7 test VM provides basic desktop application access. Bandwidth from the VDI lab standpoint is 16Mpbs down, 2Mbps up. On your end, that’s 2 down, 16 up. It is the internet; performance and speeds will vary. By design, one user session is allowed at a time. There is only one desktop instance. The idea is to use the session for a few minutes to get a feel for the client experience. The session is not for long term or production use. No warranties, use at your own risk, etc. In reality, the longer you maintain connectivity, the more chance you have of being interrupted by another user requesting to use the desktop. If you’re trying to log on and you receive a message stating “The View agent reports that this desktop is currently logging off a previous session.”, you are probably interrupting someone elses session. Try again later. If you are currently in a session and it abruptly ends, it is likely the result of someone else submitting a logon request – sorry – At this point I do not know how to prevent the session interruptions which is essentially a “following” feature which would commonly be used in a health clinic. If you have any ideas, please share in the comments section below. To maintain a safe environment, web browsing and access to some other areas of the OS has been disabled. All activity is logged. The VM will reset at regular intervals in an effort to restore back to its original clean starting point. Updated 11/6/11: Thanks to the notification of a few friendly folks, I found out the environment was no longer functional. In short, the computer password for the VDI workstation was out of sync. I’ve fixed this an enhanced the environment for longer term use which should prevent future implosions. The demo environment now supports two concurrent demo sessions using the same credentials. In addition, each demo session is deleted upon a disconnection and a new VDI workstation is built. This is all done by the addition of VMware View Composer to the environment. Jason, thanks for putting that up online great way to show off the view capaibilities. Good fun to have a look and a play. Thanks for the free and quick demo! Thanks jason for letting us playing around with this guest VM. genius idea. Thanks Jason for setting this up. I passed the link to a few colleagues to check out as well. Good to see someone sharing technology with others who don’t have access to a lab at work or home. Thanks for the test run it works really well! Thanks Jason for this. I just bought a new ipad and i want to try this. This work brilliant. Thank you for the demo of View on the IPAD, really great to be able to try it. Thanks again. Hello. Is this still available? It was online a few weeks ago but now I’m getting ‘access is restricted’ msgs. Thanks to the notification of a few friendly folks, I found out the environment was no longer functional. In short, the computer password for the VDI workstation was out of sync. I’ve fixed this an enhanced the environment for longer term use which should prevent future implosions. The demo environment now supports two concurrent demo sessions using the same credentials. In addition, each demo session is deleted upon a disconnection and a new VDI workstation is built. This is all done by the addition of VMware View Composer to the environment. Thanks Jason, this was extremely useful! Its not working anymore. Will you enable it again? There wasnt an intent to take it down. I will take a look. @dhojgaard, the issue is resolved. view client for ipad demo is available again. Thank you. I can connect but i only recive a black screen. @dhojgaard you need to allow TCP/UDP 4172 through the firewall on your end. I tried connecting to this server late in the evening and early in the morning but there never seems to be a session available. Maybe it needs a few more desktops in the pool and a 15 minute timeout to keep sessions available. It’s not a pool size issue, the desktops in the pool hung during customization and became unavailable for the brokering. I’ve resolved the current issue. Let me know if you have the issue again either here or via email. Thanks for putting this demo online. When I try and connect it says you are not entitled to use the system. Is the username and password still ipadguest? Credentials are the same however the demo environment is undergoing a rebuild to 5.0.1 so the demo environment is temporarily down. I hope to have it back up by Thursday. @Zizou The pool was broken. Try now. Glad to hear that Tim! Thank you very much, this server is great I really appreciate it ! Really good work you did with did, it helps a lot of people! any chance to see your great lab upgraded with the latest horizon suite?